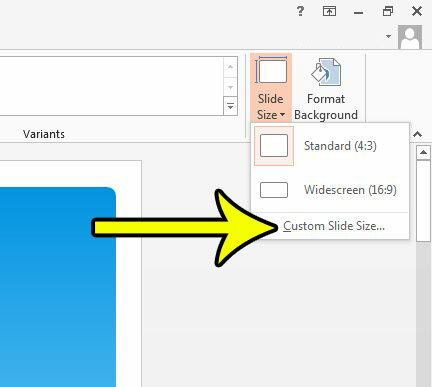 You might find that you need to change the slide size in Powerpoint 2013 if you have a project where the default size selection is not ideal. Fortunately you can change slide sizes to a number of different potential options, although the means to do so might not be immediately obvious. Our guide below will help you find the slide size menu where you can adjust the width and height of your slides to one of several preset options, or even a custom size of your choosing. You will also be able to adjust your slide orientation as well if you need to do so. 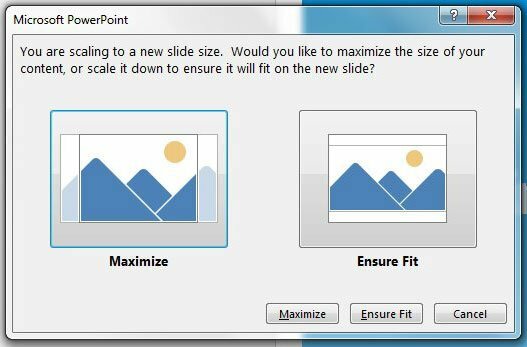 The steps below are going to show you how to adjust the size of the slides in a Powerpoint presentation. 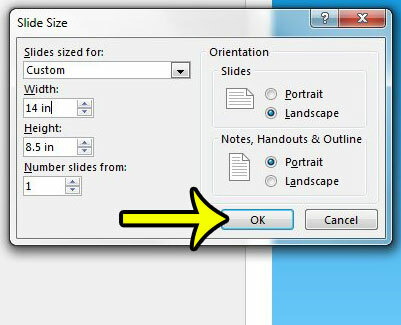 Note that these steps will only apply to the slideshow that is currently open in Powerpoint, and it will affect every slide in the presentation. 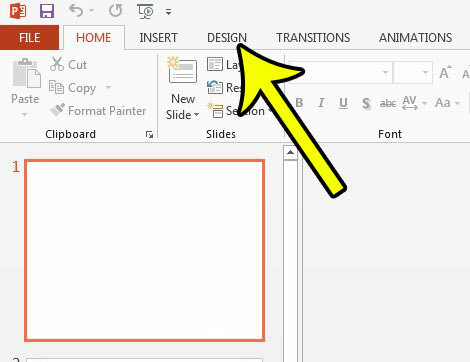 Step 1: Open your slideshow in Powerpoint 2013. Step 2: Click the Design tab at the top of the window. Step 3: Click the Slide Size button at the right side of the ribbon, then click the Custom Slide Size option. 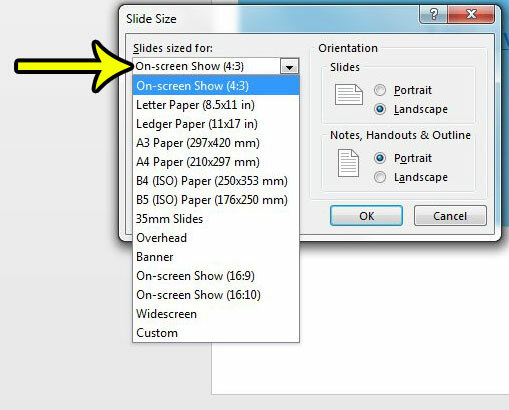 Step 4: Click the Slides sized for dropdown menu, then select the new slide size for your presentation. If the one you want isn’t listed, select the Custom option. Step 5: Adjust any of the remaining settings on this menu as needed, then click the OK button. Note that I am electing to size my slides for legal paper, so I have adjusted the width and height accordingly. Step 6: Select the Maximize or Ensure Fit option based on your preferences. Do you need your picture to be transparent, but can’t figure out how to accomplish this? Learn how to make a picture transparent in Powerpoint 2013 if you need that effect. Where is the Reduce Motion Setting on an iPhone 7?